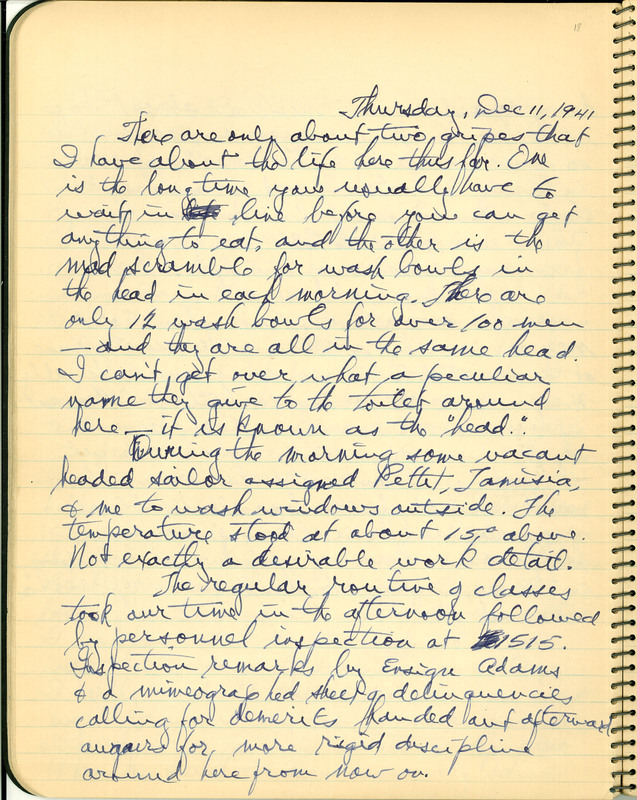 Thursday, Dec 11, 1941 There are only about two gripes that I have about the life here thus far. One is the long time you usually have to wait in line before you can get anything to eat, and the other is the mad scramble for wash bowls in the head in each morning. There are only 12 wash bowls for over 100 men - and they are all in the same head. I can't get over what a peculiar name they give to the toilet around here - it is known as the "head.." During the morning some vacant headed sailor assigned Pettet, Lamisia, & me to wash windows outside. The temperature stood at about 15º above. Not exactly a desirable work detail. The regular routine of classes took our time in the afternoon followed by personnel inspection at 1515. Inspection remarks by Ensign Adams & a mimeographed sheet of delinquencies calling for demerits handed out afterward augurs for more rigid discipline around here from now on.